What's up, folks? Megumi has written a new tune, My Cat Hates My Guts, and we did a demo of it. It's her homage to Shonen Knife. We're using a PRS Santana SE and a Squier Affinity Telecaster on it going into a Caline Pure Sky pedal and then into the computer (Presonus Studio One). The amp sim VST we are using is bx_bassdude. For drums, we are migrating from audio drum loops to using Session Drummer (which we have from the days I used to run Cakewalk Sonar). Session Drummer is a VST so we can use it in any program that uses VSTs. The loaded kit a the Led Zep kit, and the drum patterns are from Groove Monkey (Rock Essentials). It's a lot more flexible this way since we can adjust the individual hits, and we think the Led Zep kit sounds pretty good! Finally! 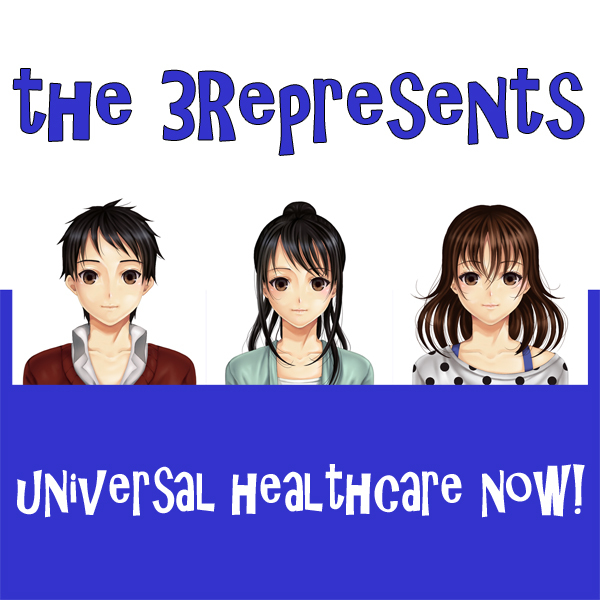 Megumi, Yasuko, and I have finally finished our upcoming album, Universal Healthcare Now! It consists of 12 songs that Megumi has written over the years. There are demos for several of the songs out there, scattered about on YouTube, Soundcloud, or whatever. Originally, it was supposed to be out in the Spring, but then it got pushed back to August, and then it got pushed back again until finally we got it done and it should be out soon! Part of the problem is that we (meaning me) are lazy, and part of the problem is that Megumi kept wanting to redo parts. And I kept wanting to redo the mixing. But it's done. IT'S DONE!!! As far as the title goes, well, that was Megumi's idea. Yasuko didn't care one way or the other, but I questioned Megumi why she thought of that. I mean, none of the songs have anything to do with healthcare!? 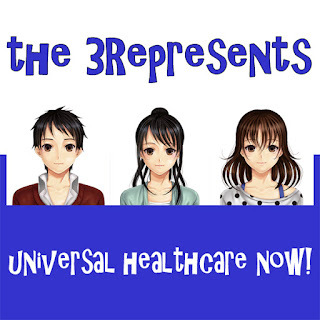 Megumi told me that she thought everybody should have universal healthcare, so if we named our CD Universal Healthcare, then everybody should have our CD! Anyway, it will probably take some time for the CD to make its way on CD Baby and especially all the distribution channels like iTunes and Spotify, so keep an eye out for it! We'll put out a video on YouTube of the single, You Say, soon. Although, it's kind of stupid to say that it's the single--it doesn't mean anything. It's not like it's a separate thing going out to radio stations. But I like to say that because it reminds me of the old days. You Say features Anne McCue on guitar! Update: the album is now available on Bandcamp and CD Baby! Hey everybody! I hope you all made it through Typhoon Trami okay. It sure seems like we're getting a lot of typhoons here recently! Our good friends Amy and Chris from America are visiting us, and they got caught up in the typhoon and hunkered down with me, Yasuko and Megumi. Since we were stuck inside, Megumi thought it was a good idea to jam (as long as the power held out, hehe). Megumi had been working on a song that she felt wasn't really suited for her voice, so she asked Amy if she would sing on it. Chris chipped in on the harmony part. Megumi is playing a Fender Stratocaster going into a Caline Pure Sky pedal. That goes into the DAW (Presonus Studio One) and the bx_bassdude amp sim through a Presonus Audiobox USB96 interface. Yasuko is playing a Yamaha RBX260 bass that goes into the bx_bassdude amp sim as well. Megumi wrote the music, but the lyrics are from a Christina Rossetti poem, Song (When I am Dead, My Dearest). Megumi started getting into the works of Christina Rossetti when she took a class on 19th century English Literature and learned about the Pre-Rafaelites. Hey guys! We've upgraded to Vocaloid 5! We think this is a must upgrade if you are still using Vocaloid 3. The Vocaloid 5 editor has a bunch of new, very useful features, such as Attack/Release parameters as well as built-in styles for the Vocaloid 5 voicebanks (which are really good. 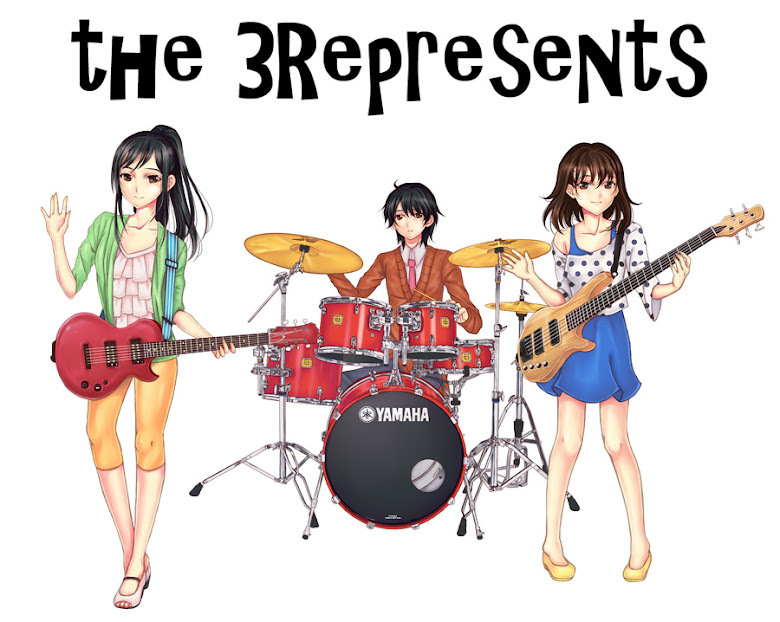 In the future, you'll hear our friends Amy, Chris, Kaori, and Ken singing with us!). Listen to Gumi singing this Jonathan Coulton song, My Monkey, in the Vocaloid 3 Editor. Now, listen to Gumi singing this in the Vocaloid 5 Editor. There are subtle but noticeable differences. You don't have any built-in styles with Vocaloid 3 voicebanks like you would with the Vocaloid 5 voicebanks, but you get to modify many more parameters in Vocaloid 5. This really breathes new life into the Vocaloid 3 voicebanks. Megumi doesn't hesitate to tell Yasuko and me how much she's improved as a singer every chance she gets! In the remix, which I think sounds better overall, I got to use some new plugins. I'm using Waves Vocal Rider on Gumi's vocals to help smooth it out better, and I'm using my new bx_bassdude plugin on the guitars and bass. This is a huge improvement over the AmpireXT amp sim that comes with Presonus Studio One. If you don't have any need for metal type amp sims and only want that Fender sound, bx_bassdude is the plugin to get! We entered the Hatsune Miku Expo 2018 Song Contest...and lost. Not even an honorable mention. Yasuko just wanted free tickets to the MikuExpo. But hey, it was still fun, as we had a special guest, Hatsune Miku, sing on it! The song was inspired by watching a bunch of YouTube videos of Japanese rock bands in the 1950s and 1960s. Very groovy, man! We were also greatly inspired by a fantastically snarling performance by Cliff Richard and the Shadows of Move It! on TV. Labels: Hatsune Miku, MikuExpo, song contest, Time's Up! Hey everyone, here's a new song to cap off 2017! It was done an example for the 2017 Losertown Japan Grab Bag Giveaway! You know, there still is time to whip up an original Vocaloid song and enter! This is the first song we did using our new Presonus Audiobox USB 96 interface. Before we were messing around with a cheap XLR to USB cable. The cable is okay if that's all you have, but the sound using an actual USB audio interface is so much better! Now that we have a proper interface, Megumi wants us to do an actual album! I'm kind of nervous about that, but Yasuko and I agree--we should do it! So that will be our project for 2018! In the meantime, I'm trying to learn as much as possible about mixing. Here's wishing everyone a wonderful, fantastic holiday season! Megumi says Happy Thanksgiving to everyone! Copyright © 2016 Steven Mon. All Rights Reserved. Artwork by Emiko Kouji. Simple theme. Powered by Blogger.